Judge Dismisses Assisted Suicide Case Against Pennsylvania Nurse : Shots - Health News Barbara Mancini was charged with assisting her father's suicide by providing him with a lethal dose of morphine. A judge's decision in her favor is the latest in a series of developments signaling a reluctance of courts and state legislatures to criminalize medical care that may hasten death. The decision is the latest in a series of recent developments signaling a reluctance of courts and state legislatures to criminalize medical care that may hasten death. Assisting in suicide is illegal in all but five states — Oregon, Washington, Montana, Vermont and New Mexico. Legal experts say Mancini's prosecution for allegedly assisting a suicide isn't unique, but such cases are increasingly rare — a sign that attitudes about end-of-life decisions are changing, whatever most statutes say. Pennsylvania filed charges against Mancini last summer based on circumstances surrounding her father's death in February 2013. 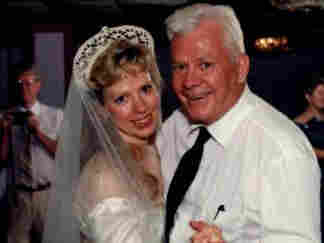 Joseph Yourshaw, the father, was a home hospice patient in failing health. When a hospice nurse checked on him and found him unresponsive, the hospice called 911 and had an ambulance take him to the hospital against the wishes of his family. He was revived, then died four days later. Mancini was later charged with assisting his suicide by providing him with a lethal dose of morphine. "This case demonstrates that the government has no business interfering in families' end-of-life decisions," Mickey MacIntyre of the advocacy group Compassion and Choices said in a statement. "This prosecution could have chilled end-of-life decisions and pain care for millions of future terminally ill patients who simply want to die at home, peacefully and with dignity." In a scathing 47-page opinion, Judge Jacqueline Russell wrote that Pennsylvania Attorney General Kathleen Kane didn't establish that Mancini had committed a crime — that she intended to help her ailing father commit suicide rather than simply to alleviate his pain. "An accused cannot be found to have aided, and then caused, a third person to attempt suicide without competent proof that an attempted suicide had indeed occurred," Russell wrote. She said the Commonwealth of Pennsylvania relied on "speculation and guess" to support its prosecution of Mancini. "A jury may not receive a case where it must rely on conjecture to reach a verdict," the judge wrote. Russell said the commonwealth's case "appears to have been based on little independent investigation, significant hearsay — including double hearsay, received from third persons — speculation, guess, and [Mancini's] incriminating statements." According to a hospice nurse and a police officer who talked to Mancini on Feb. 7, 2013, she said she had given him an entire vial of morphine to end his life. He had previously told family members and hospice workers that he wished to die. Mancini doesn't deny giving him the morphine bottle, but she denied that she intended to help him commit suicide and said she wanted only to relieve his pain. The judge said that in pretrial proceedings last August prosecutors never established how much morphine Yourshaw took, whether the amount was potentially lethal, and whether Mancini knew he had taken enough to cause death. Nor did the evidence indicate whether she "actively participated in Mr. Yourshaw's actual ingestion of the morphine. Rather ... Mr. Yourshaw was competent, strong-willed, ambulatory, capable of retrieving and opening his bottle of medicine and consuming its contents." Prosecutors said Mancini's plea to hospice personnel not to transport her father to the hospital and "rescue" him from an overdose with a morphine antidote was evidence of her criminal intent to help him die. The judge rejected that argument. "Mr. Yourshaw was in the end-stage of his life, he wanted to die at home, and he did not want to be resuscitated when the time came that he was to die," she wrote. "His daughter knew, as did hospice personnel, that it would be contrary to Mr. Yourshaw's wishes if he were taken to the hospital when in the final moments of his life. In light of the evidence the Commonwealth produced, and failed to produce, Defendant's conduct in not seeking emergency intervention under the circumstances cannot be deemed ... a criminal act." A county coroner ruled that Yourshaw died from a morphine overdose. Mancini's lawyers challenged that conclusion, saying that his death, four days after he was taken to the hospital and resuscitated, couldn't be blamed on the morphine dose he took at home. The judge didn't address that issue, since she ruled that prosecutors never established that a crime had occurred in the first place. Anthony Forray, a deputy attorney general who prosecuted the case, characterized the evidence against Mancini in a pretrial hearing as "overwhelming." He contended that she pressured hospice personnel to prescribe the morphine and handed him a full bottle with a 40-day supply, knowing that it would kill him if he took it. A spokesman for Attorney General Kane said Tuesday afternoon that his office had not reviewed Russell's opinion and wanted to review it before making a comment. Compassion and Choices, which has supported Mancini and publicized the case nationally, is urging Kane not to appeal its dismissal.